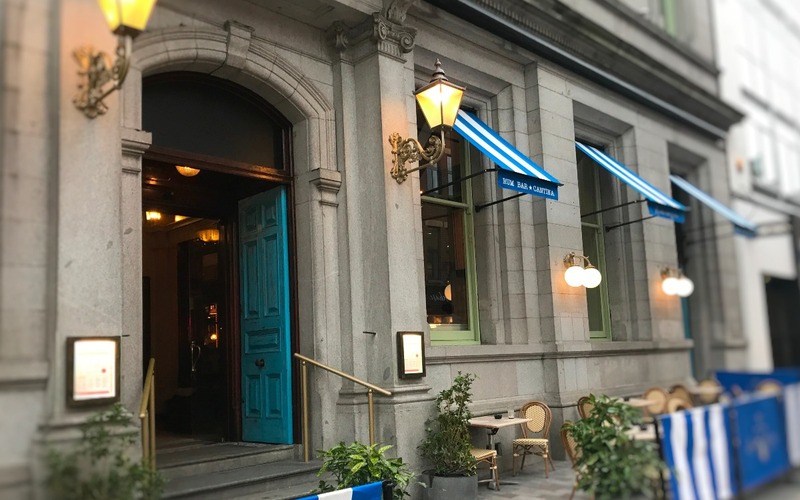 We were recently invited along to check out the food on offer in Revolución de Cuba, a Cuban tapas and cocktail bar located in Belfast City Centre. 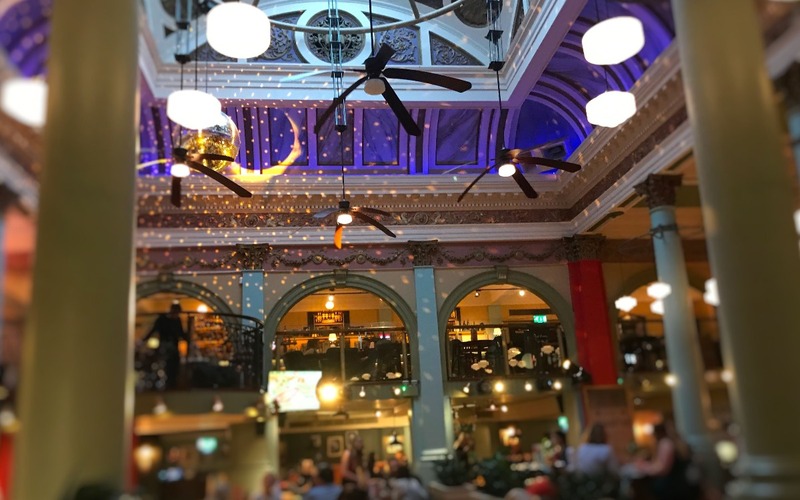 Set in the old Cafe Vaudeville building, we arrived on Thursday night at around 6pm for our meal, and we could quickly see that this was a popular time to dine. There was a great atmosphere in the premises, with large and small groups making the most of the vast food and drinks menu. With live music, Revolución de Cuba is certainly a great venue to visit if you’re looking for a great night out with a large group of friends. The tapas menu, cocktails deals, and music make it perfect for groups looking for dining options in Belfast. If you’re looking somewhere for a quiet or more intimate dining experience for two (or even a smaller group), Revolución de Cuba probably isn’t for you. Read on below to find out more about the food we enjoyed during our recent visit. To start we decided to have a bit of a feast and ordered six tapas meals. The menu recommends three for a starter or six for a main, but as we wanted to get a real taste (excuse the pun) for what Revolución de Cuba had to offer, we decided to go with a tapas feast before enjoying a main. 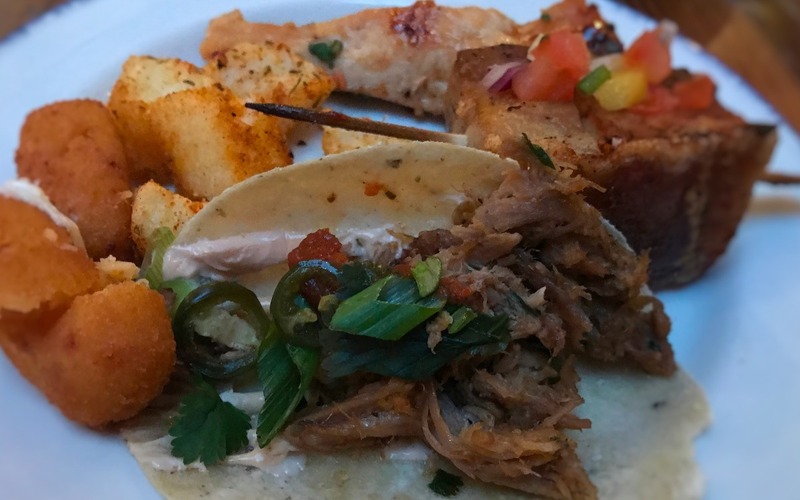 The six dishes we sampled for our tapas starter were Honey & Lime Chicken Skewers, Chorizo Croquettes, Roasted Pork Tacos, Pork Belly Skewers, Prawns and Patatas Bravas. 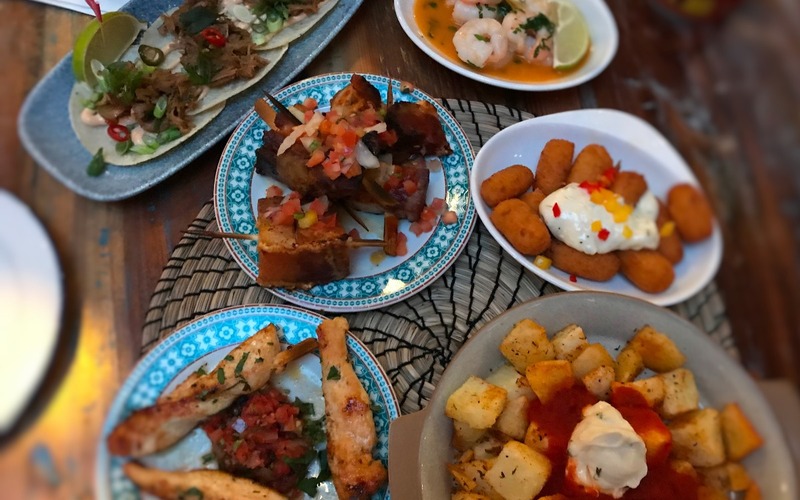 In truth, our eyes were probably bigger than our belly but this selection of tapas certainly highlighted what Revolución de Cuba is all about – big, bold flavours. While we would certainly go on to enjoy our main, for us, this is the big draw of Revolución de Cuba, particularly if planning a large night out with a group. There aren’t enough tapas restaurants in Belfast, and Revolución de Cuba hits the spot with a fab tapas menu and small plates that simply delivers a big slap of flavour! The pork belly is slow roasted in a rum sauce and was absolutely divine, while the chorizo croquettes totally hit the spot. The prawns and chicken skewers both delivered a fresh note to palette thanks to the chilli and lime dressing that accompanied both. The pulled pork tacos were served with caramalised pineapple and salsa, delivering a real taste of the Carribean. With the live band playing some top acoustic tunes in the background, you can see why the small tapas dishes and cocktails attract large groups. After the tapas starter, it was time to enjoy the main course. 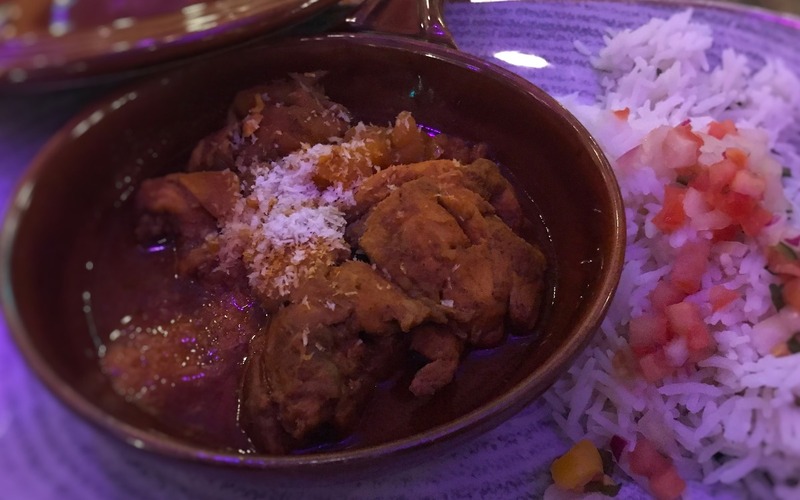 For main, we continued to explore the Carribean offering at Revolución de Cuba by enjoying a fragrant chicken curry dish. The curry was served with a basmati rice and a tasty salsa. There was a real kick from the curry and the presentation was great. If you’re a fan of curry dishes when you dine out, you won’t be disappointed. The second main we got was a chicken enchilada. The chicken was marinated in lime, pineapple, and soy, and was served with peppers and onions. This would be a great dish with a few beers or a cocktail if you’re out dining with friends. The dish was completed with a tomato sauce and grilled cheese, and served with rice and black beans – a hit! After quite a feast with the tapas and main courses, we decided to share a dessert, and what a dessert it was. 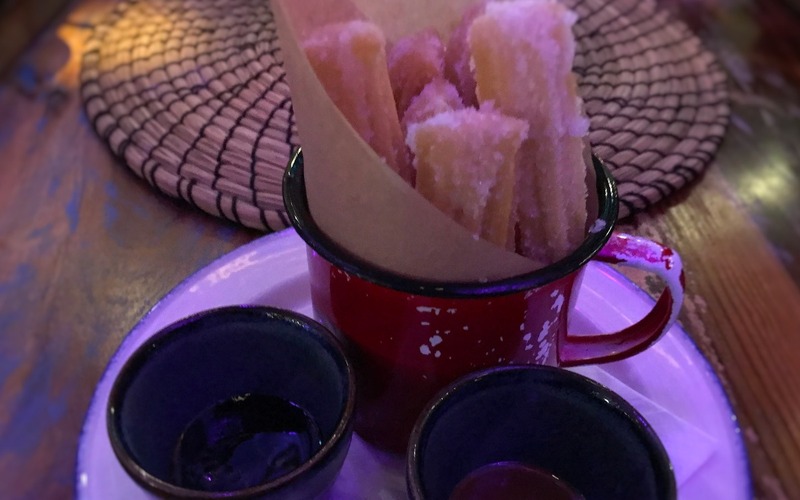 The Carribean and Latin influence continued on the dessert menu, and once the menu was set down in front of us, there was only going to be one winner – churros! Churros have been a firm favourite of ours ever since our honeymoon in Madrid when we visited the famous Chocolatería San Ginés. While these churros aren’t at the level of Chocolatería San Ginés (although very few actually are), this was a great way to end the evening, and the chocolate and rum caramel dips that accompanied the churros were sublime. A great way to finish the meal if dining with friends. Revolución de Cuba is a Belfast dining experience with a difference, in a truly grand setting. If you’re looking for a quiet meal for two, it’s probably not for you. If you’re looking for somewhere to dine with friends or a large group then you can’t go long. A fab tapas menu, churros that will leave you wanting more and a cocktail menu that will have you sitting on long into the night, it’s just what the doctor ordered. The live music when we were there helped create a great atmosphere, and we’ve no doubt come the weekend, Revolución de Cuba is well worth visiting if you’re in Belfast. 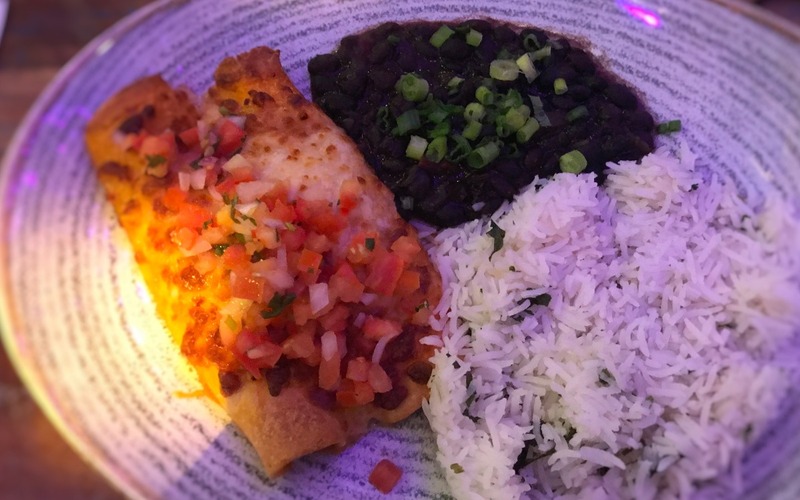 Have you dined at Revolución de Cuba? We’d love to know what you thought of it. Let us know below or on our Facebook and Twitter page. Next Post Is Hadskis Home To Belfast’s Best Burger?